Found a link to This is Fly in my spam/junk folder. Sorry this is a couple weeks old. But on cold December mornings looking through older folders can find you a couple good reads. 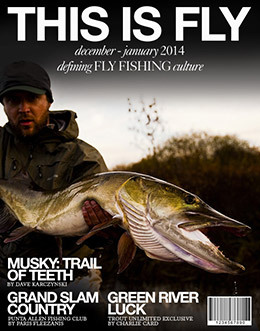 A good article hear on muskie fishing, do love chasing these predators. Check it out. Also booking trips for 2014. Have a couple spots still open in prime time. Feel free to contact me via email . Speaking of muskie working with Erik right now on a couple new clips. Hope to be done soon, will post links here. Topwater action caught on video, is one little hint.